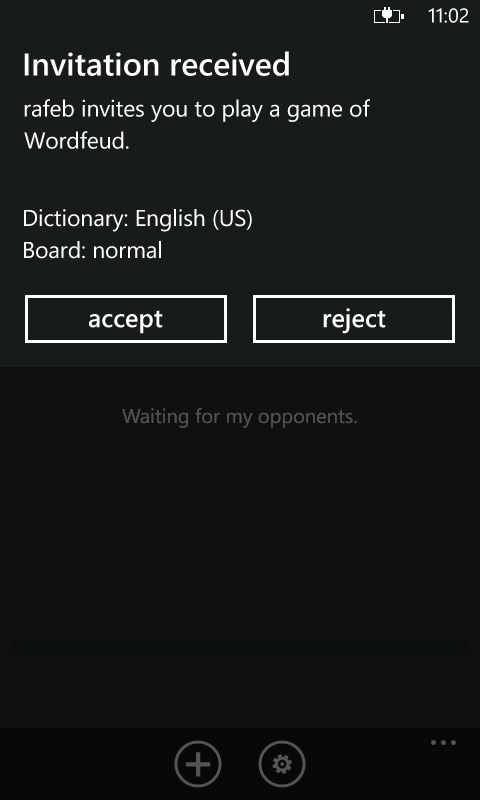 And so the next big name in the 'not quite Scrabble genre' arrives on Windows Phone. In term of broad strokes, there's little difference between this title and Words by Post (reviewed here). Both titles are played on a board that's an adaption of the Scrabble standard, with more bonus squares in better positions for high scores and combinations; both games allow local play but are stronger when playing friends or random opponents no matter where they are in the world, on a turn by turn basis; and both have subtle hooks into your social networks. But which is better? The game is played on the familiar sized 15x15 board, with various tiles offering double or triple scores on the individual letters or the whole word if you cover them. You'll play one word from your seven letter tiles, refill your rack with letters from a tile pool, your opponent has a turn, and this continues until the tile pool is empty and someone clears their letter rack. And the best score wins. Letting you choose your opponent from a friends list of existing Wordfeud players (the app is also available on iOS and Android) can make this a very personal game. You can simply challenge someone in the same room as you and pass the handset around, or you can grab someone from your Windows Phone address book (or punch in an email address). 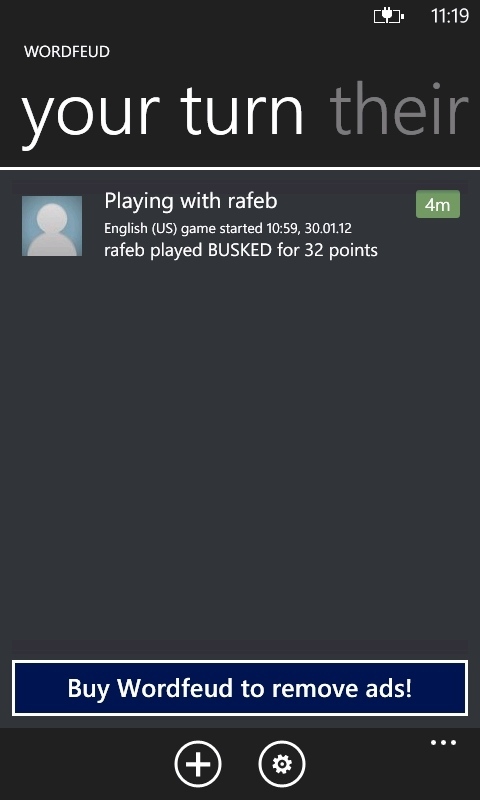 If they've got Wordfeud then they'll get a challenge from you in the game, otherwise they'll be asked to download a copy of the game to play you. Which is fun. 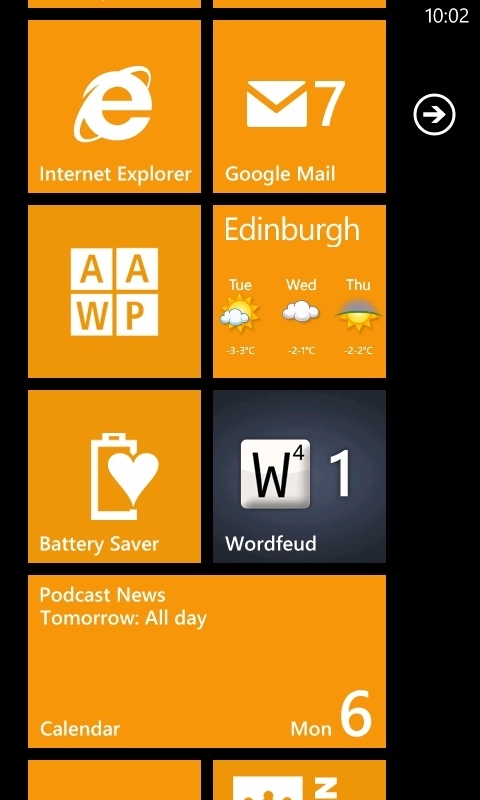 But it's the more remote option that is even more fun (at least for me). 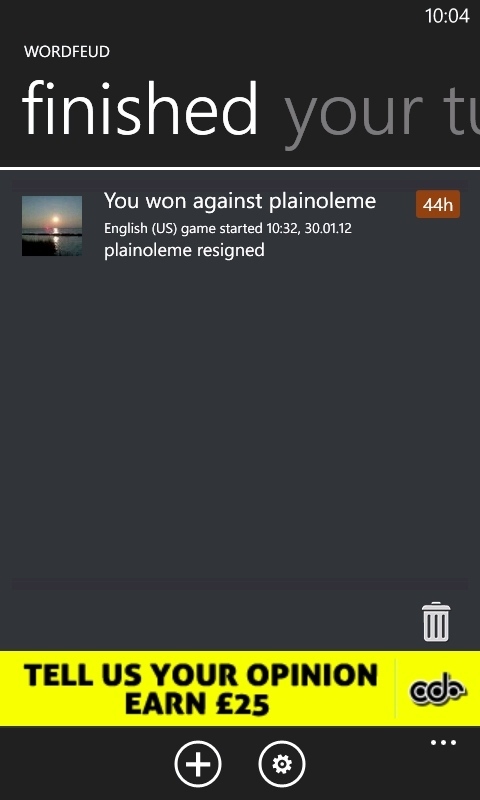 You can let the Wordfeud system find you a random opponent anywhere in the world, and the challenge will be issued on your behalf. Once the game is set up, you can move into the metro styled interface, showing you games where you need to make a move (you can start and play more than one game at a time), games where your opponent has to move, and your finished games. 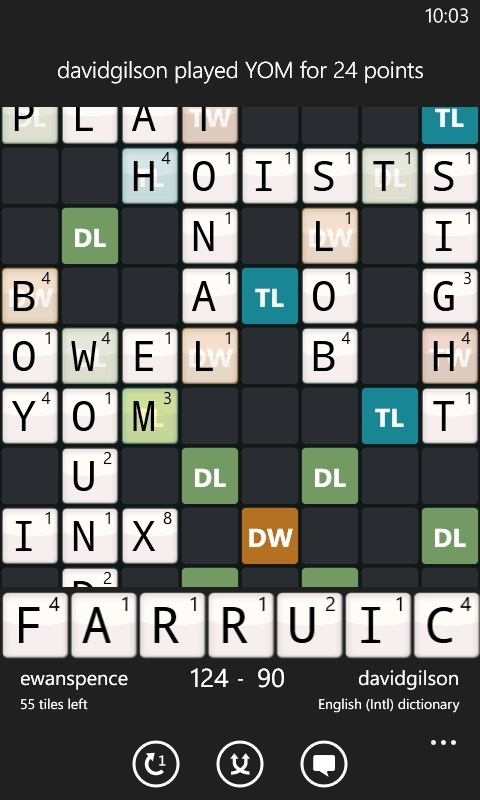 Wordfeud certainly looks the part. The graphics are solid and have some subtle touches to give them a solidity and presence - even though they have a slight translucent quality so you can see which bonus squares are underneath them. I'm not sure why they made that last decision, given bonus squares are only used once. It means you can see the pretty diagonals of colour peeking through, but I'd prefer less of a distraction when looking over the board. I also think that another pass needs to be made on the UI around a move being made. 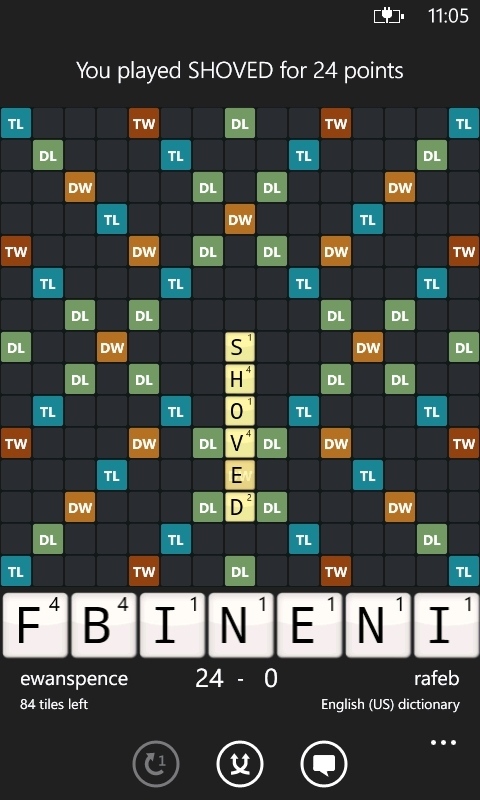 There's no indication on what your potential score will be when placing a word, and it seems very sensitive when placing tiles on the board. I kept pushing tiles into the wrong squares and needed to really focus on accurate placement. Wordfeud loses a point or two for these issues. Wordfeud is available as a title to purchase or an ad-supported version which is fully featured, but makes a lot of noise that you have to buy the title to remove the ads. To be honest, a full screen reminder after every move and a bundle of garishly coloured banners in other parts of the interface make it perfectly clear, but in a way that feels too pushy for me. Yes, remind the user, but I think they hit the user with too big a stick to get their two dollars and ninety nine cents. The option to chat to your opponents is also part of the turn-based interface and works well, although it's rare that I would use this or see any of the random challenges I've made chatting to me. Notifications that a move has been made by your opponents can be toggled on and off. 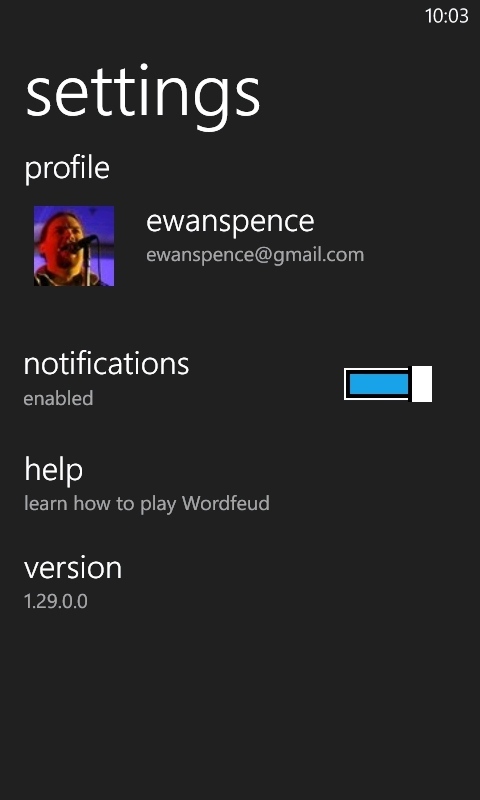 When off, you need to open up Wordfeud to see what's happening, or you can turn on the push-based alerts and have them appear both as a pop up status message (the classic 'toast' method), but also as a number in the Live Tile if you pin one to your screen. The question of which title to buy is a tricky one. Fundamentally, they are both the same game, with the same options and playing choices available. Wordfeud has the option to shuffle the bonus squares around for a twist to the standard game, while Words by Post allows you to see your long term progress through a Chess-style ELO skill ranking that changes depending on the opponents you beat or lose to. That's really the only clear cut difference between the two titles. Personally I'm going with Words by Post, and the reason is simple. I already have a number of friends from real life, and players I've met through that game. 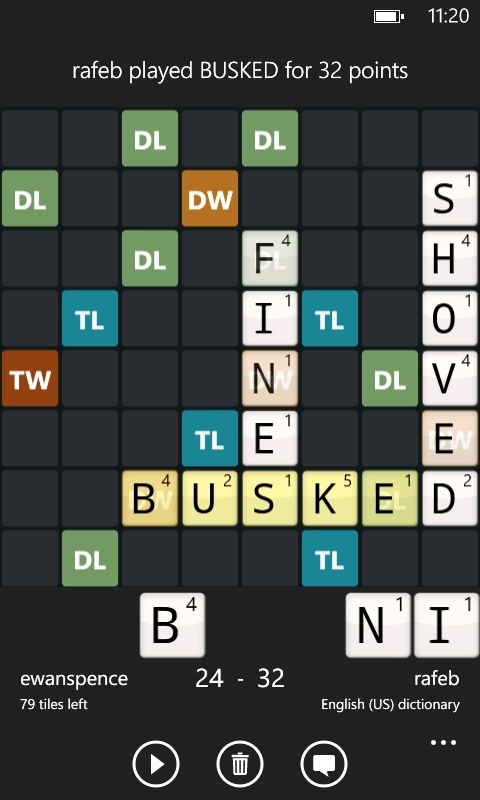 I also think that the placing of the tiles on the board is slightly less accurate on Wordfeud. But when you have applications where the code is of such high standards, it's the little things that make the difference.